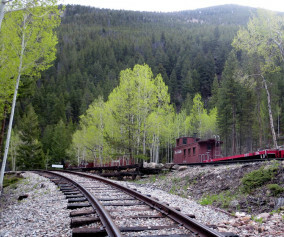 A hike to castle ruins in Colorado? Yep. 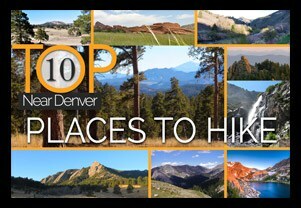 Throw in a lookout tower, great view of Denver, of Red Rocks, and of the mountains, and you’ve got some of the highlights of the Mount Falcon Trail. 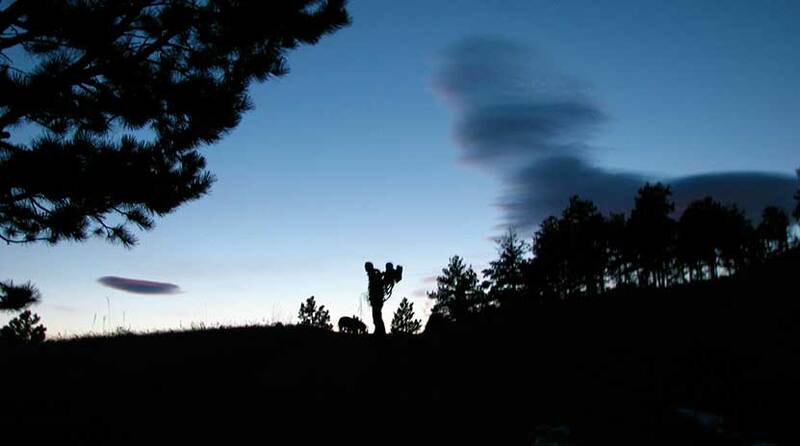 The trailhead is nestled in a community in the foothills just about 40 minutes from Denver. Here we detail a 2.3 mile loop trail that hits all the destinations. Mount Falcon features several trails. 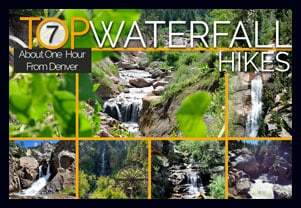 By combining a few, you can create a 2.3 mile loop and take in several historic sites as well as breathtaking views of Denver, Red Rocks, and the Front Range. 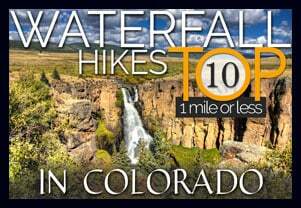 This is makes it one of the best hikes close to Denver for visiting friends and family. Because it is an easy hike and has a relatively flat and wide trail, you can take the jogging stroller on this one, too. 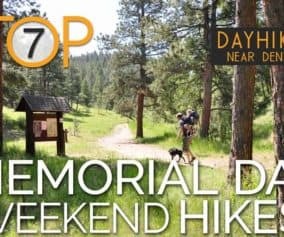 If you are looking for more great trails for your family, be sure to check out our Kid Friendly Trails Near Denver and our recommended Colorado Hikes for Visiting Friends and Family pages. If hiking with kids, be sure to access it via the West Trailhead as described in this post. Map apps and other sites may take you to the very demanding east trailhead, which is very exposed to the sun and has heavy mountain bike traffic. The Loop: Start at the parking lot off of Mt. 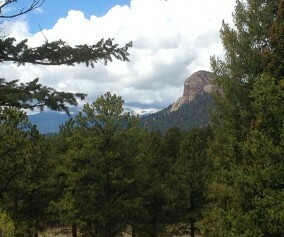 Falcon Road, and when you come to a fork in the trail, take the Tower Trail to your right. 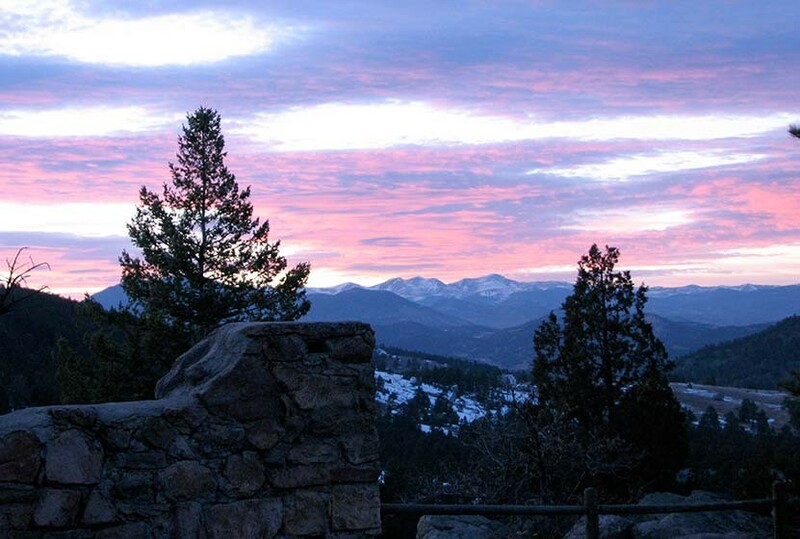 Soon you’ll pass the Eagle Eye Shelter which offers great views towards Mount Evans and the surrounding foothills. Stay on the Tower Trail until you get to the Fire Tower which commands a panoramic view of Denver, Red Rocks, and more of the Front Range of Colorado. Then continue on the Tower Trail until it intersects with the Meadow Trail. Take the Meadow Trail North/Left for about .3 miles. It will end at the Castle Trail – take a left. The Castle Trail will lead you back to the parking lot, but don’t head back until you stop at the ruins of the old Walker Home. The views from here are beautiful as well. I ran this last Summer. It was a challenge to say the least, but would be a really nice hike. It’s a decent Incline and while you hike along the ridge you do get some great views of Denver. Mountain Bikers love this hike, so keep your pooch on leash. Easy access from Denver. This is a nice hike. We went from the west entrance down to the castle ruins and the summer white house site. My kids are all teens and everyone had a good time. The ruins are pretty neat and the views are pretty. Not much shade on this trail. Good for families and history lovers. We did the above recommended loop, and I recommend taking a picture of the trail map when you pass it, because otherwise we would have had a little trouble with the directions. None of the terrain is particularly difficult, but there is very little shade for most of the hike, with a few exceptions for benches and a picnic shelter. Make sure and bring water, and a bowl if you have a dog. The ruins were beautiful! I enjoy mountain biking and hiking this area. My kids love this too. Great views and easy places for shade stops when kids over heat. Did this trail today with my three little ones (8, 5, and 2). They all walked the whole way to the castle ruins and most of the way back. We took the meadow trail on the way back, which was pretty, but just a little more than my youngest could handle. If you have an all terrain stroller, you could easily push a little one the whole way. Tons of dogs along this route which my kids loved and it kept them going. We did this trail in early June of this year with a visiting friend. We chose it since it sounded like we’d get some good views without too much elevation gain (and without being at a high elevation), which could be too much for our friend coming from sea level. It was a fairly hot day so we really appreciated that the majority of it was partially or fully shaded. The beginning and end sections of the trail (I think the meadow trail) both are full sun, so that was a little more difficult. We personally found the castle ruins to be less exciting than the lookout tower. The tower did have some really pretty views as did the little lodge that was on the side of the trail near the beginning. That little shelter/lodge would be a great picnic lunch spot. Overall — great for visiting family, could be nice at peak wildflower blooming (they were already pretty when we were there), doable even on a hot day, trail was in very nice condition. Is this hike doable in December? Or will it be too cold/snowy? Obviously conditions vary year to year, but does anyone know of a hike that would most likely be good in the end December? The trailhead is accessed by driving through a community, so my guess is that it’s plowed regularly (I’ll ask a friend–she lives right up near the trailhead). Another great family hike with great views that is close to Denver. Very easy to find also. I did this hike today with my kids (ages 8, 7, and 4). We ended up going further on the Castle Trail and added a couple miles to our trip. We all loved it. Beautiful views, wildlife, and lots of fun! 1) Tower Trail is most definitely NOT stroller friendly. Castle Trail to Walker House Ruins is. Meadow Trail is equivocal. 2) Get there early–very popular spot. I tried this loop over the weekend. If you have a stroller just do the meadow trail. Tower trail has stairs and branches and is not stroller friendly at all! Commenting to add — go past the ruins on Castle Trail (continue on instead of taking Meadow Trail) and you can see a gorgeous site of Red Rocks Amphitheater from above in the distance. I recommend going in the late afternoon and bring a camera… there are often herds of deer grazing all along the trails. 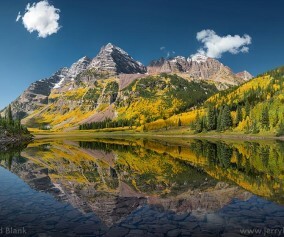 Thinking of taking my soccer team (11 year olds) on a hike to a summit near Denver for some pre-season training and fun. Wondering if Mt Falcon is a good option, but haven’t had a chance to preview it. Any thoughts? The kids are pretty fit and have a good spirit. Looking for a hike that’s challenging for them but not overwhelming. Any advice? Hi George, Mt. Falcon would be a good choice. It’s more demanding from the lower parking lot. Check the trail profile on our site which has directions from the upper lot. You’ve got good options up there when it comes to hike distance, and you have great views. Weather can come up quick on Mt. Falcon, so just be aware that things could change fast. I’d also recommend any of the hikes in Red Rocks park. This is NOT an easy hike. The trail we took starting on the eastern side covered a large gain in elevation, had uneven footing with some large and loose rock, was NOT wide (barely had room to let mountain bikers pass), and had little shade. The trails in this area are rated like ski runs (green, blue, black). The trail is a blue intermediate all the way. I WOULD NOT RECOMMEND FOR KIDS UNDER 10.
it is very demanding and one I would not recommend for kids. This is why we have profiled the hike from the west lot and given directions accordingly. This was my first time taking my dog out for a hike since moving to Colorado a few months ago. We loved it! An amazing photo opportunity and a beautiful view of the city from the tower. Kind of off the beaten path, but still popular. We went on a Saturday afternoon, and there were lots of people out, but it was not crowded at all. Very clean park and restroom. Plenty of places to stop and rest along the way. We followed the advice to bring a lunch, and it was a good idea because we were exhausted after. It was very dusty, and VERY sunny (it’s a meadow). Bring sunscreen and sun protection or you will regret it!!!!! Just the right amount of hike – thanks for the guide!